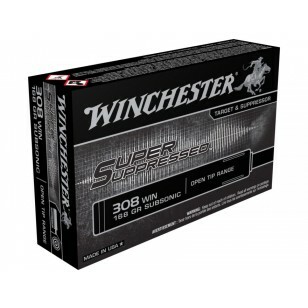 Winchester Super Suppressed 308 168 Grain Subsonic Ammunition SUP308. Box of 20 Rounds. Designed specifically for use with suppressed firearms. The use and ownership of suppressors across the United States is growing in popularity. The Winchester Super Suppressed line of rifle ammunition offers clean and reliable performance and is engineered for noise reduction, decreased barrel/suppressor fouling and recoil mitigation. The rifle round pushes velocities below the speed of sound, which produce lower decibel levels. This product is consistently accurate and a trusted round for target and range shooting.